I first made this cake over 20 years ago for my youngest daughter's birthday cake. 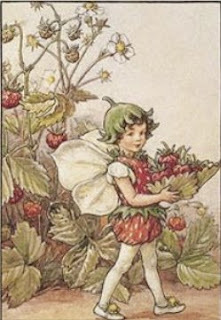 She was crazy about Strawberry Shortcake (the doll). The reason I called it tall instead of short is because I made genoise for the cake instead of shortcake. It's a really awesome cake. The proportions I will give here are not exact, as I usually don't worry about such things. 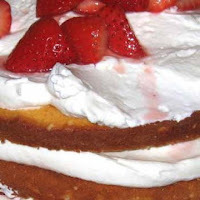 I think that any amout of genoise, strawberries, and whipped cream together is a wonderful dessert. 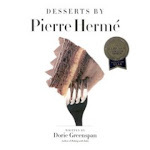 My recipe for the genoise comes from "The Art of Fine Baking" by Paula Beck. The page for the recipe has actually fallen out, but I keep it in place. It's a bit tricky to make, and doesn't always turn out the way you'd like, but it's really good when it does. 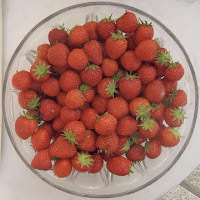 I haven't made this is a while, and as strawberry season is soon upon us I should make it. Now genoise has a reputation for being a bit hard to make. But that shouldn't stop you. Though even the best of bakers can have a bad moment with this cake, as is attested to by Rose Levy Beranbaum. This recipe uses butter, but you can also make it without the butter. As this cake is a fluffy batter and not a rising with leavening batter, you could put a parchment collar on the round pans. Put the eggs and sugar into the kitchenaide mixing bowl and then set over a pan of gently simmering water, not touching the bowl. Heat, stirring from time to time, until the sugar is visibly dissolved. This will take maybe five minutes. When the eggs are lukewarm to your touch remove from the heat. Put the bowl into the mixer and beat with the whisk attachment on high speed for 10 to 15 minutes. The mixture will about triple and look like whipped cream. Remove from the mixer and fold in the flour by sprinkling it a little at a time on top of the egg mixture and folding in gently with a spatula. Then gently fold in the clarified butter and vanilla. Be especially careful not to over-mix. What you want is to have the flour and butter suspended in the foamy egg and sugar mixture. Pour the batter into the pan of choice. For the strawberry tall cake I used the 7 inch pans and bake for 20 to 30 minutes, all depending on the pan. Keep you eyes on the cake. I should say keep your nose alert. It's always been my observation that a cake that is almost done will suddenly be smelled in the house. *clarifying butter: Melt the butter slowly. Let it sit for a bit to separate. Skim off the foam that rises to the top, and gently pour the butter off of the milk solids, which have settled to the bottom. Then let the butter cool down before putting it into the cake batter. Wash, hull, and slice up the berries. Sprinkle on the sugar, stir gently, and let sit for a while to get the juices running. 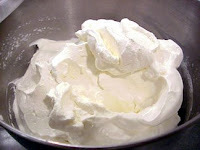 The first step for good firm whipped cream is to put the mixing bowl and beater into the freezer for about 15 minutes. Then add the cream and sugar and vanilla to the well chilled bowl and whip until it's thick, but not until it's butter. My mother likes runny whipped cream, but that will not work here or the cake will slip right off. Put down a layer of genoise, put on 1/3 the berries, top with 1/3 of the whipped cream. Repeat two more times. This cake is not meant to look like a fancy bakery cake with smooth whipped cream completely covering the cake. It is meant to have a homey strawberry shortcake look, except that it's tall instead. And when you cut it it is a bit of a mess, but very tasty.